This is one more post on Facebook style notification and in this post we have make simple Facebook type Footer Pop up notification by using PHP script with Ajax Jquery method and Bootstrap framework. In one of the previous post we have already made discussion on How to make Facebook style header notification by using PHP code with Bootstrap Ajax and JQuery. In that post we have display notification alert on page header pop up number and after click on notification menu we can seen list of notification. But in this post if any event has made done then we will pop up notification on left bottom side of page and after some time of interval notification alert message will be disappear from web page. 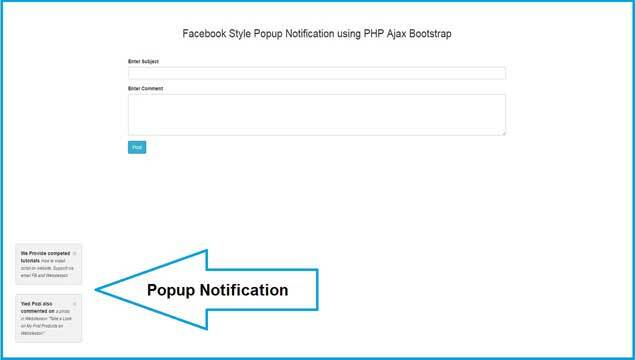 This is the second part of Facebook style notification alert by using PHP language with Ajax Jquery and Bootstrap. This type of feature we have seen in Facebook, if you have familiar with Facebook, then in that if you have share any link or image and some one has like or share your post or image then you have seen pop up notification with message on web page left bottom side and after some time of interval that alert notification has been remove from webpage. So here some one has like or share you photo or link then one event has been occur and that event notification you have seen on your web page. So this type of Notification system we have going to develop in PHP by using Ajax JQuery method with Bootstrap framework. We have use simple Form data insert data event has use to implement this pop up alert notification system. So when we have enter data into database then at that time we will received alert pop up notification on web page. We have use Ajax with Jquery for fetch data from database. And for display Alert notification we have use Bootstrap alert class. So By using Bootstrap Ajax JQuery with PHP we have make simple Facebook style pop up notification feature. I hope you will enjoy this post and learn something new from this post. So, Keep visiting our website for web tutorial.